couldn’t because YouTube didn’t offer that feature? Well, now you can poll your viewers directly in your video using poll cards. Poll cards enable viewers to participate in multiple-choice polls directly within your videos.You can display your card at a specific time in your video and see the results in real time. 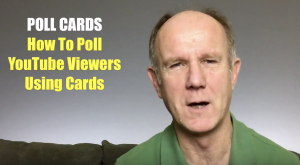 Here’s how to use cards to poll your YouTube viewers…. How do you view the poll results? 1. Viewers must be logged in to their YouTube account to participate in a poll. If they are logged out they’ll can be prompted to log in before they can vote. 2. Once you delete a card you won’t be able to access the card and the votes will be lost. Now you know how to create, edit and remove poll cards on YouTube so you can poll your viewers.